The 385-acre Chicago Botanic Garden welcomes more than 750,000 visitors each year. Its new Daniel F. and Ada L. Rice Plant Science Center provides laboratories and teaching facilities for more than 200 researchers, including PhD scientists, land managers, students, and interns. The Plant Science Center was designed to achieve the US Green Building Council's gold rating for Leadership in Energy and Environmental Design (LEED). Combining the Botanic Garden organization's commitment to plant study with a desire to add practical benefits and public education, 16,000 square feet of the center’s roof was built as a green-roof garden. The roof garden benefits the building by adding insulation and absorbing sunshine, which lower the cooling requirements of the building. It also captures and holds storm-water runoff that can then be used for landscape watering. The garden benefits the program side of the Chicago Botanic Garden by functioning as a research site. There the staff can study plants to find out which of them work well in rooftop gardens. 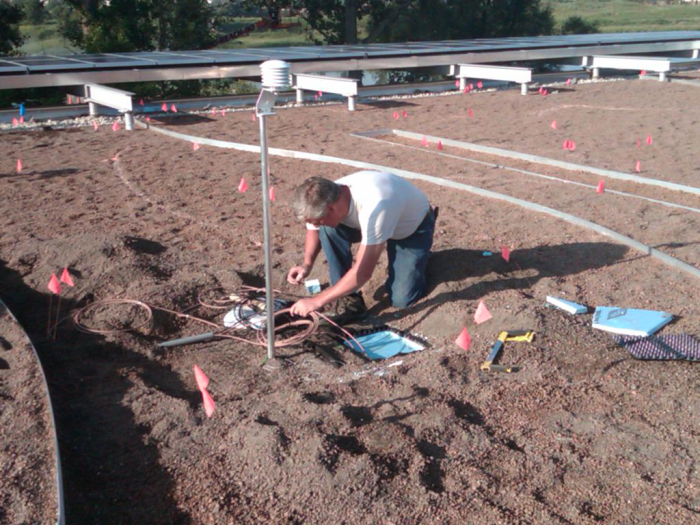 Adams Environmental Systems, with 37 years of monitoring experience, partnered with the construction company and with the scientists at the garden to design this extensive system. They installed more than 50 sensors, and used three Campbell Scientific dataloggers and a couple of AM25T multiplexers to collect and transmit the data. The CR1000 datalogger connects to the building's Ethernet network, and Campbell's LoggerNet software collects the data. By analyzing the information generated, researchers can determine the benefits of different types of roof gardens. They can also compare results from different soil-bed thicknesses, different amounts of water, and, most importantly for their program, different types of plants. With so much data made available, designers of rooftop gardens will be able to learn from these experiments as they work on other gardens. Like they say at the Chicago Botanic Gardens, "Save the plants. Save the planet."